* among the still unanswered anthrax questions … Who decided to destroy the large collection of anthrax samples at the Iowa State University? « CASE CLOSED … what really happened in the 2001 anthrax attacks? « * an important message to the GAO: There are 8 FOIA requests pending at USAMRIID … we highly recommend that you see these documents before issuing your report. * among the still unanswered anthrax questions … Who decided to destroy the large collection of anthrax samples at the Iowa State University? This reminded me of the fact that a large reservoir of anthrax, located at the Iowa State University in Ames, Iowa was purposely DESTROYED shortly after the initial attacks, clearly with FBI concurrence. The reasons behind this bizarre event have never been adequately explained. Who decided to destroy those valuable samples? Who was aware of the destruction before it happened? What reasons were given at the time, and do those reasons seem to make any sense? And also, why haven’t we heard more about this issue, even in Schachtman’s otherwise very comprehensive account? DXer adds … in its report, GAO can also address any issues relating to Iowa. Q: Did the FBI or U.S. Department of Justice consult with any genetics expert when they were asked in October 2001 whether it was okay for the [B. anthracis strains held at] Iowa State University and USDA Ames (at the strip mall) to be destroyed? A: I was not consulted nor am I familiar with the actual steps that lead to the destruction of these materials. During that time period (late 2001), I was doubtlessly the most engaged microbial geneticist working with the FBI. If I wasn’t consulted, then probably none others were either. Additional Commentary: It is hard to understand why this destruction was done and why it was allowed to occur. Clearly someone in Iowa panicked at being in the media bright lights and wanted to get rid of the material. If this was really authorized by the FBI, who that authority was has not been released, to my knowledge. If the investigation had eventually lead back to Iowa, this would have been viewed as destruction of evidence and obstruction of justice. Now that would have been a public relations nightmare! By way of some background, I interviewed all the professors and posted what they reported, the reasons given etc. The new Dean of the Vet school encouraged the key professor involved to speak with me after an initial reluctance. And so I ended up speaking with a number of people at ISU to include Dr. Roth and Dr. Cheville if I am remembering the names correctly. Jim D at microbiology was especially helpful and was not involved in the misguided decision to destroy the collection. Now first it is important to distinguish between ISU and Agriculture Department. The labs are nearby but they are physically distinct and under different management. Some of the ISU professors worked at at the Ag lab. There was a BL-3 Ag there at USDA. But a basic first mistake most people make in discussing the issue is confusing ISU with USDA Ames. 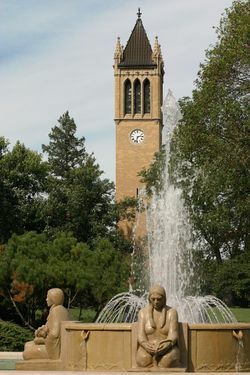 Second, the numerous strains kept at ISU were never shown to have been Ames. Even with the ambiguity of the mailing label (with their being no cancellation on the envelope showing where it was postmarked), the strains at ISU were not known or shown to have Ames. On the other hand, the important William Broad article based on the correspondence file provided by Gregory Knudson does not actually definitively resolve the question as to the routing of the envelope. That would require a cancellation, a postmark. I obtained the mailing label and uploaded it at various websites. Dr. Knudson, who later went to work for the CIA, had asked USDA Iowa to help collect virulent strains. The conventional, but not authoritatively proven consensus, is that it was mailed directly from Texas. There were two slants mailed that arrived at USAMRIID. Dr. Ivins could not find the second one and presumed Dr. Knudson took it with him when he left USAMRIID. (Incredibly, the fellow who mailed it from Texas had not even been interviewed. He had retired to someplace like Idaho and we had to track down; he does not recall specifics; the FBI instead was relying on the Director of the Texas TVMDL). As for whether USDA had Ames — whether from the first collection or later in the course of vaccine work — it gets less clear. Thomas Bunn, manager of the BL-3 lab, declined to respond. A formal FOIA request was vetted through some sort of national terrorism committee. The nice FOIA person said there were no responsive documents. But he took pains to emphasize that at least they had nothing that was “known as Ames.” One logically would want to ask Dr. Bunn, who had worked at USAMRIID, whether he had some from his days at USAMRIID. Now as for the reason for the destruction, the offered reason was the cost of National Guard protection. That didn’t make much sense, as a practical matter, because it was a simple thing to courier them over to the USDA lab which was very nearby. But in the rush of events we can forgive a University President for not knowing too much about the particulars of regulation of select agents. As for who at DOJ approved, or did not object, Professor Boyle would point to Buck Revell as someone to ask. But I have no idea. DOJ, for its part, would say that it was getting guidance from CDC. Certainly, with the benefit of hindsight, it was a bonehead decision and the FBI science people (to include experts like Budowie), if consulted, likely would have advised restraint and preservation of evidence. Dr. Keim, like Dr. Hugh-Jones, in hindsight agrees that it was very unfortunate decision. Dr. Kimothy Smith could say whether he was ever asked but likely not given that Dr. Keim doesn’t know anything about it. (GAO could easily find out what FBI scientist was asked and obtain written record of the response). In-house scientists might have been less attuned to the nature of the genetic inquiry that was second nature to the experts in Dr. Keim’s lab and now the stuff of popular press articles. ISU is a fascinating case study given virulent anthrax was handled at a shopping mall in a satellite lab — photographs show the very poor physical conditions. It illustrates just how simple it would be for virulent anthrax to be stolen. Also, Jim D. in microbiology, had a prototype device on loan the summer of 2001 called the MICROBIAL VAC that concentrated anthrax by a factor of 10 using repeated centrifugation and sequential filtration. From an Idaho company funded by an SBIR. The inventor, Bruce Bradley, tells me it could be used to make anthrax into a powder but only on a small scale. The advisor on the project (at WSU) was the mentor and co-author with a supporter of Bin Laden’s sheiks from Al-Timimi’s charity, Dr. Diab. That supporter, a PhD animal geneticist, had quit his job, where he researched making dried powders for foodstuffs, and came here to Syracuse. Then he went back to Idaho where the webmaster Al-Hussayen was being investigated and was quoted there in August 2002. Then he returned here. The supporter of Bin Laden’s sheiks was arrested in February 2003, the day and minute Ali Al-Timimi’s townhouse was searched on Northern Virginia. The scientist who had come to Syracuse, Ismail, lived a mile from me and is very gracious fellow with highly educated family and friends. He was placed under house arrest, I believe, but never questioned (at last report) My source on info relating to the charity knew nothing of this person’s work. Another good friend who studies polymers and living organisms lives in the apartment complex the scientist was in. And so I hope to someday meet him and do a proper interview. When I once contacted him by telephone, there was “too much going on” (I presumed surveillance etc.) for him to talk. His mentor says he was expert in mixing silica and so maybe has insights on the silicon signature also. His supervisor, JH, though says he would just use it in mixing. His supervisor/colleague and wife were concerned about him because they had not heard from him since he abruptly quit his PhD research job and came here ostensibly to work for a spin-off of Ali-Al Timimi’s charity, the one based in Ann Arbor, Michigan. (Research on animal foodstuffs involves microencapsulation which protects the medicine from being destroyed by enzymes before reaching the target organ). Out in Idaho, Sami’s MSA VP, whose room was searched at the same time, had a PhD thesis with 350 pages of drying coefficients. So people who don’t think highly religious people are not also often highly educated need to get out more. At the time of the searches of Ali’s townhouse and the locations in Idaho, 100 agents came here in February 2003 and simultaneously interviewed 150 people. The FBI used the cover of OPERATION IMMINENT HORIZON in investigating Amerithrax. But it is all classified, Ali Al-Timimi is perhaps a TOP ECHELON informant and so it will be a difficult subject for the GAO to gain insights on. But truth is a funny thing. Given the gaps in proof and speculation that dominates the handling of this case, maybe all we can do is wait until after the next 911 and look back with the benefit of hindsight. This entry was posted on December 22, 2011 at 8:47 am	and is filed under Uncategorized. Tagged: *** 2001 anthrax attacks, *** Amerithrax, *** Dr. Bruce Ivins, *** FBI anthrax investigation, Iowa Ames destroyed, Iowa State University, missing ames anthrax, Noah Schactman, WIRED. You can follow any responses to this entry through the RSS 2.0 feed. You can skip to the end and leave a response. Pinging is currently not allowed. As I recall an article by the Wash Po’s Jerry Markon, Ali’s colleague in Maryland was involved in helping LeT purchase an unmanned drone. Such a drone can be used for cropdusting. Thank goodness the intel is that LeT wanted it for camera / recon. But if GAO researchers play poker and understand pot odds, they hopefully understand that assessments of the cards one is holding needs to be made based partly on what is at stake — what is in the pot. Has DIA tracked down the 8,000 $15,000 DragonFlyers that have been sold? Or did the FBI as part of OPERATION TRIPWIRE? This is not a time for the FBI to continue to play hide the ball with documents bearing on its Ivins Theory.